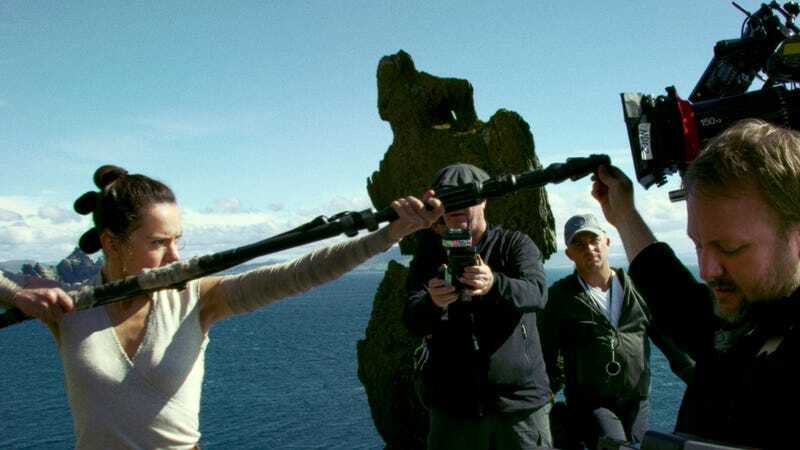 Director Rian Johnson (right) directs a scene from Star Wars: The Last Jedi. For many Star Wars fans, a moment almost as exciting as the actual film debut is when it gets a home release. That’s when all the deleted scenes come out, adding color and context to the story. In the case of Star Wars: The Last Jedi, there were a few moments left on the cutting room floor that seem pretty important (or at least interesting) in hindsight. Entertainment Weekly has released synopses for five deleted scenes that will be featured on the Blu-ray and digital release for The Last Jedi. They include a moment where Luke and Leia—galaxies apart—simultaneously mourn the death of Han Solo. There’s also a scene where BB-8, who apparently moonlights as a Peeping Tom, shows Finn a hologram of the moment Rey said goodbye to him at the end of The Force Awakens... to try and convince him not to abandon the Resistance. Those are sweet, but it makes sense to have them cut for time (you can read more about them here). The others are, let’s just say, carry a bit more weight. Luke Skywalker (Mark Hamill) has approximately three lessons to teach... give or take. Mainly... it may not actually have been his third lesson. We previously posted a description of Luke and Rey’s final in-person confrontation on Ahch-To. He tells her a warring tribe is raiding the caretaker village, something the Jedi would normally choose not to involve themselves in (out of fear of making it worse). Rey refuses and rushes to help... only to find there was no raid, it was actually a party. In the description, as originally reported by /Film, Luke told Rey that this was his final lesson. However, director Rian Johnson insists that it wasn’t. Rather, he said it served more as the straw that broke their bond, leading her further down the path to Kylo Ren. “Originally it was just a breaking point for her. ‘Okay, he’s gone too far,’” Johnson said. “This is the point where she finally says, ‘Okay, if you’re not gonna help, then I’ve wasted too much time here.” Johnson said he ultimately cut it because Rey didn’t need that breaking point in order to be tempted by the Dark Side... she was already on her way there. And it made more sense for Luke to be betrayed by her talks with Kylo Ren if he felt he was still making progress with her, as opposed to having them on the outs. One question remains, though: What was Luke’s third lesson? Johnson said it’s not directly addressed, leaving it open to fan interpretation... or, quite possibly, further exploration in Star Wars: Episode IX. One of the funniest mysteries to come out of The Last Jedi was, “What the hell happened to Tom Hardy?” The actor, British pop star Gary Barlow, and royal princes Harry and William were supposed to make cameos as First Order Stormtroopers during Finn’s infiltration of Supreme Leader Snoke’s flagship, supposedly as Finn was brought to Captain Phasma for punishment. The scene was reportedly cut, then not cut, then probably cut, leaving us wondering where the hell Tom Hardy was on the ship. This deleted scene from The Last Jedi showed more of Finn, Rose, and DJ as they made their way through the flagship to finish their mission. They head into an elevator, where Finn is recognized by a Stormtrooper. But it’s totally cool, because the Stormtrooper doesn’t know Finn abandoned their ranks, he thinks Finn got a promotion (because of his stolen uniform). Captain Phasma (Gwendoline Christie) can dish it but she sure can’t take it. Apparently, the moment Phasma “died” in The Last Jedi may not have actually killed her, at least not in the original version. Her and Finn’s battle was originally supposed to be longer, and include a callback to one of The Force Awakens’ more questionable moments. According to the EW description, the battle between Finn and Phasma ultimately led to her getting the upper hand, surrounding Finn with the help of her Stormtroopers. However, Finn had a plan up his sleeve: He told the other Stormtroopers that Phasma’s a coward, revealing how easily she handed over the shield codes to Starkiller Base to save her own chromed hide. Fearing what the Stormtrooper’s reaction might be to the revelation, Phasma shoots all of them and returns to her fight with Finn which resulted in the same fall into the fire. That said, Johnson calls her “the Kenny from South Park of Star Wars,” so who knows what might happen. Star Wars: The Last Jedi comes out on digital release March 13, and will be out on Blu-ray and DVD March 27. Deleted scenes and all.